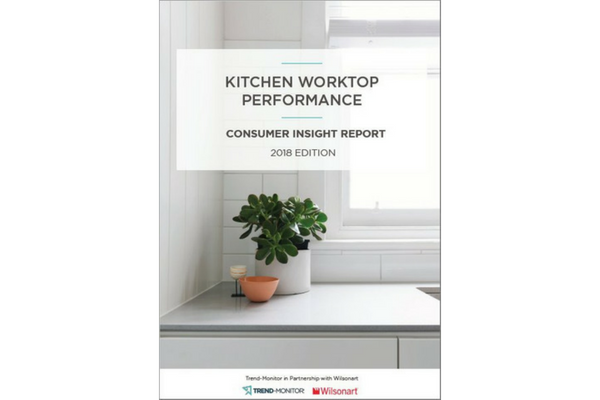 This report investigates consumer expectations for kitchen worktops in terms of performance levels and the attributes influencing the purchase of their next kitchen worktop. The growing importance of worktops in kitchen design has resulted in new materials, colours and textures coming into the market and consumers are now faced with an increasing array of worktop products to choose from. Consumer expectations in terms of how a kitchen worktop should perform in today’s multi-functional kitchen are complex and often tied into daily habits and household circumstances rather than product knowledge or the price tag. For this purposes of this research, TREND-MONITOR was pleased to partner with WILSONART a leading manufacturer of laminate, quartz and solid surface worktops. This partnership has resulted in a focused piece of industry research that is directly relevant to manufacturers and retailers in this fast growing market sector and answers some important questions in terms of consumer purchase decisions, product usage and the performance versus price ratio. The popularity of laminate worktops is highlighted in this research with half of the householders surveyed having a laminate worktop in their kitchen. Over half of homeowners surveyed hadn’t changed their worktop since moving into their current home. Laminate worktops are kept for the longest, a third are over 10 years old. 40% of homes have a separate utility room, although 14% of these utility rooms don’t accommodate a worktop. Aesthetics (colour and finish) and heat resistance are the key purchase influences for kitchen worktops. Worktop practicality is more important than price when choosing a new worktop, with 3/4 of householders prepared to pay more for greater worktop practicality. The research was undertaken via an online consumer survey with a representative sample of UK householders. The survey was conducted online during April 2018 and targeted a response rate of 1000+ respondents.